Oh my, you have to love that grin. “I’m a pretty girl and as sweet as sugar too. Must be why my foster mom calls me moon pie! She say’s I’m all that and I’m a great house guest. “I’m house trained, Love to go on walks and say hi to all the neighbors and my kiddie friends. I live with my foster sister and “The Cat”! I love them both! I’m very polite with my sister even when she steals my stuff. I just wait for her to find something else then I get it back. I’m not a rough houser and I prefer to just play tug and chase toys. Squeakers are my favorite and I LOVE my octopus! “As you can see from my pictures I like to be goofy. “The Cat” is fun and I like to push him with my nose until he swats me! I hang in my crate while mom is at work and I sleep there at night. Give me a little peanut butter in my kong and I’ll race you in there! I’m quiet as a mouse and don’t fuss at all! 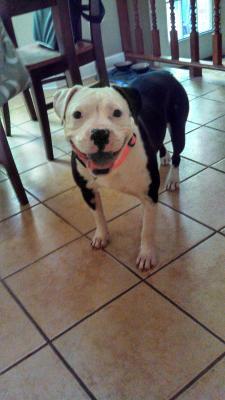 “My foster mom says I don’t have a mean bone in my body and nothing bothers me. The WCAC is always full of great animals looking for their furever homes. They are located at 820 Beacon Lake Drive and open daily from noon to 6:00 p.m. You can also check out the adoption gallery to look for your new love.